An ECG triggered high pitch (3.2) spiral CT scan acquired 8-16 seconds after the administration of contrast media and achievement of 100 HU in the ascending aorta best displays the difference in enhancement between ischemic/infarcted and remote myocardium. If this CT scan is been performed under pharmacological stress and repeated at rest, reversible ischemia may be distinguished agains infarcted myocardium. In our experience, regadenoson is superior to adenosine to provoce stress induced ischemia. The rest scan with beta blockage may be performed before the stress scan to avoid image distorsion by motion artifacts when diagnosing the coronary arteries. This scan protocol is associated with much less radiation compared to dynamic CTA. The total amount of radiation for a stress and rest scan is in the range of 2 mSv and may be sufficient to diagnose clinically relevant ischemia myocardial ischemia. 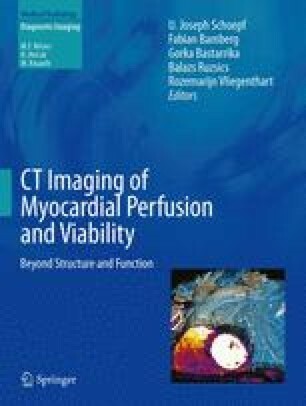 However, this approach does not allow for quantitate assessment of myocardial blood flow and is therefore not suited to follow for changes in myocardial perfusion under treatment.